Monday was probably one of the most fun days of my life. 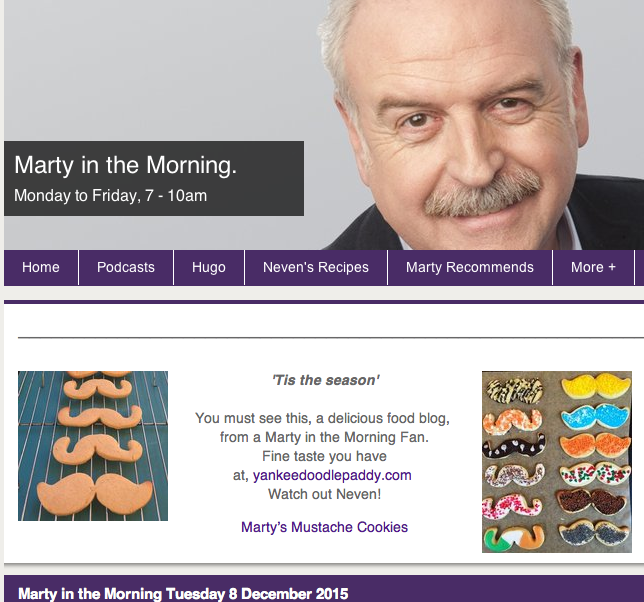 I had the Mancrush Monday with my all time fav Marty Whelan and baked some special mustache cookies. Then I was like a little kid decorating them in all different designs. He was so very kind and actually surprised me by reading out my email and recipe, whilst I was in the middle of doing the snapchat tutorial! Here is the link to his radio program. Just click on that day (Monday the 7th of Dec). if you want to hear his utter astonishment at being chosen as a #mancrush (you just have fast forward about 1 hour and 40 mins into his program). But his programs are so good, I think you will enjoy a listen of the whole show! So then, get this, he even posted before and after photos of the cookies and a link to my blog on his website. Wowza! Forget crush, I love this man! Yikes! Now I felt the pressure to get them packed up safely so they wouldn’t arrive a crumbled mess. Then they might look like whiskers instead of an actual mustache! 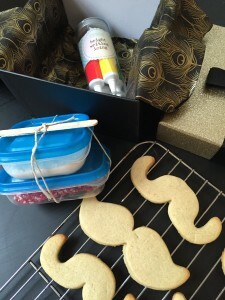 However, it was a race against time as I wanted to get the dozen mustaches posted out to him as soon as possible! If you know me, you know I prefer to have people enjoy my baked treats fresh out of the oven. So as it is, I knew it will be a few days before he received them. So I opted to decorate them with water icing and sprinkles instead of royal icing due to time constraints. Concerned at how they would look when they arrived I decide to come up with a back up plan. I packed up another dozen mustache cookies, but plain undecorated ones. And I included a “decorate it yourself” kit with tubes of colored icing, sprinkles and icing sugar in a tub along with a wooden stick and instructions of how to mix it with water. 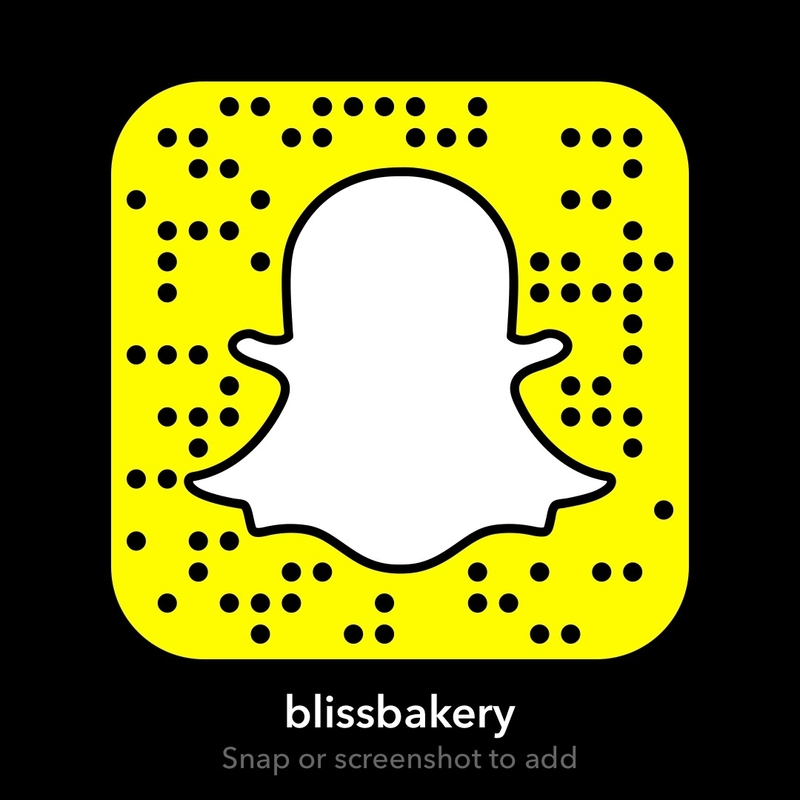 Because I got a massive amount of new snapchat followers as I’ve mentioned, due to his radio announcement and some other followers giving shout outs, I decided to do a give away of the rest of the cookies. I posted a written notice on snapchat, since the bloody video aspect was on the fritz Tuesday. I was amazed and overwhelmed at the response! So many fabulous requests and I wish I could have given away cookies to all the folks who entered. But the lady who won was literally over the moon with excitement. So I mailed that lot as well, bubble wrapped and all. The folks in the post office have started calling me the “cookie lady” because every time I show up there, that is what I am sending. I’ve done cookie give aways before now. Last week I sent off some of the Lemon Ricotta Cookies I made on the #womancrushwednesday to a lovely winner. And I did another cookie giveaway after my Tuesday Treat field trip to Biscuiteers where I made some pretty elaborate cookies with royal icing, and took those in to post to the winners. I’ve promised the staff at the post office I’ll bring some in for them before Christmas arrives. Otherwise they have threatened to rip open one of my packages. Yet, I am still in the cookie mode. Next Wednesday the 16th will be the big reveal of the Great Food Blogger Cookie Swap where I get to share photos and the recipe of the cookies I made and sent, and also show pics of the ones I received. 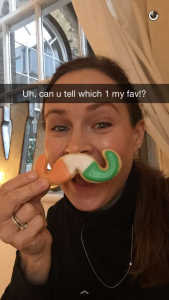 As well, the bloggers I sent my cookies to will be posting photos of them. So hopefully those arrived in one piece. And I have an important person I will be seeing this weekend and I wanted to bake cookies for them as well. The only good thing in this situation is that they will be hand delivered, so no worry about cookies crumbling! So time to break out the mixer…oh that’s right, I never put it away. Always there at the ready! Ah I have to give props to my sturdy Kitchen Aid mixer!!! By the way, I actually have two. One, which is still in America, and the other one I bought when we moved to Ireland. I couldn’t bring the American one because of the different electric plug! Big splurge to have not only one but two, but for someone who bakes as often as I do, it is a necessity! So on to these amazing cookies I have baking today. They are a Spiced Pumpkin Oatmeal Cookie with a Maple Glaze and the recipe is from Chowhound! 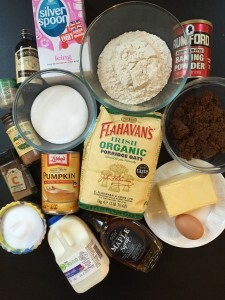 I know I’ve shared a lot of pumpkin recipes with you already, but if you’re not a pumpkin fan, this might be the recipe to help you see the light. They are chewy, flavorful and dare I say healthy? 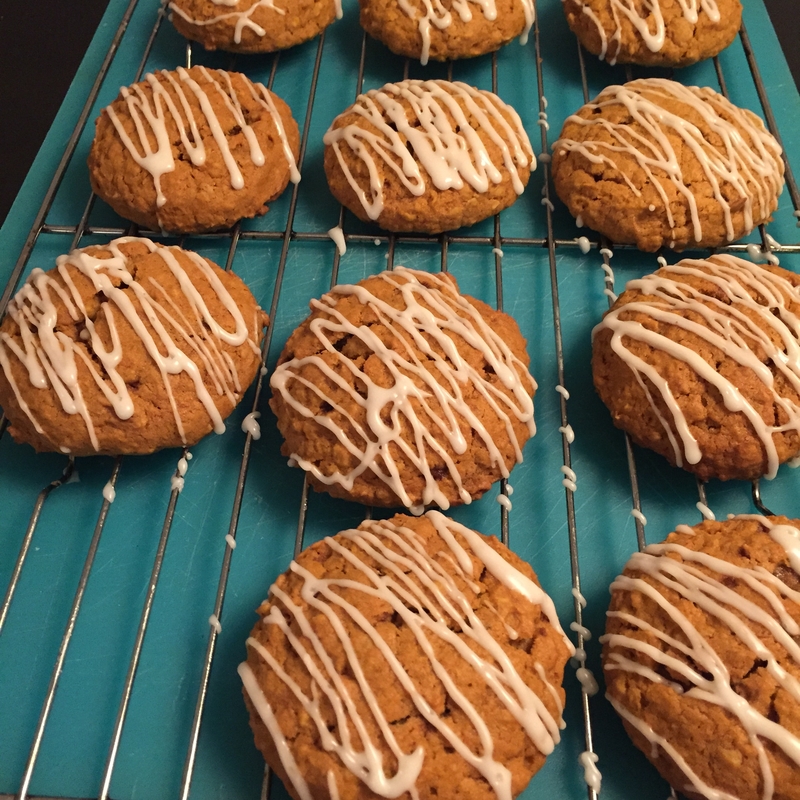 Okay, they have butter and sugar, but the pumpkin and oats make this one a better choice than say a package of Jammie Dodgers! And the oats help reduce cholesterol and the pumpkin helps aid in weight loss so it pretty much balances it all out! Tee hee! 6. Drop 8 dough rounds per baking sheet by the scant 1/4 cup, staggering them 2 inches apart on the prepared sheets.. Place the remaining dough in the refrigerator. 2. Place all of the cooled cookies on the reserved parchment sheets. Dip a fork into the glaze and drizzle it over the cookies in a zigzag pattern. Let the cookies sit at room temperature until the glaze has set, about 20 minutes. I posted a video to my instagram page of applying the maple glaze on the cookies to the song, “Pour Your Sugar on Me” by Def Leppard. Yeah, I defo have fun! 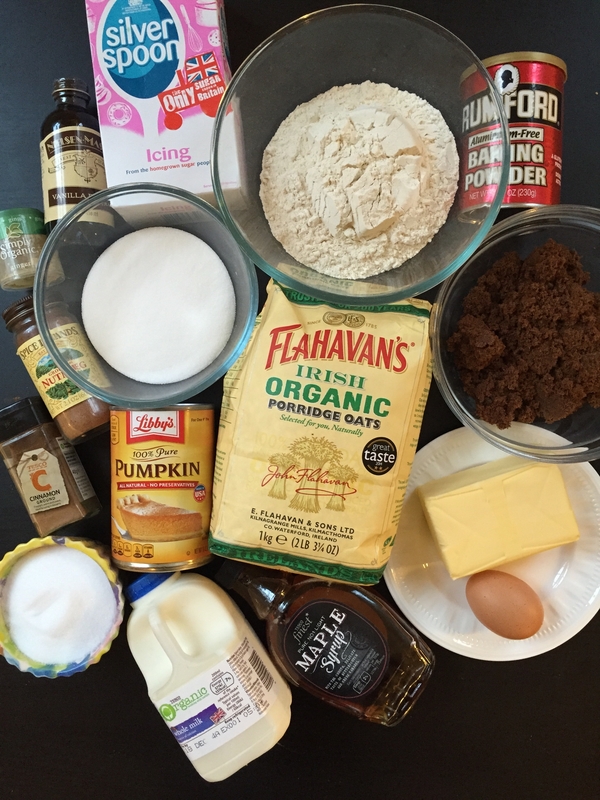 If you noticed the photo of the ingredients you might have seen that the two stars of the show are representing my Yankee Doodle Paddy moniker. Libby’s Pure Pumpkin Puree is the number one seller in America. And thankfully I can find it over on this side of the world (ahem, at a much higher price but worth it). The Flahavan’s Organic Porridge Oats are also available in a local supermarket and it is the number one selling oatmeal in Ireland! So this cookie could end up being a YDP signature snack! Hmm, looks like from the photo I already tucked into one there. But all in the name of quality control! LOL! Did you know that the phrase, “That’s how the cookie crumbles” has absolutely no concrete origin? Sure, it can be translated into a few common idioms such as “that’s life” etc. But there is no unified opinion on when it came into use and who first said it. So many phrases we use in everyday vernacular can be traced to different forms of literature such as the Bible, Shakespeare etc. But I tell you one thing, with all my cookies being shipped here there and everywhere, I’m coming up with a new version of the phrase. 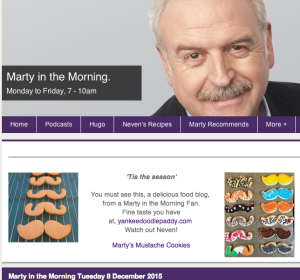 On this day anyway, it’s gonna be “that’s how the cookie hopefully won’t crumble!” Fingers crossed, I just want Marty Whelan, the winner of the give away, and the three foodie bloggers to all share photos of cookies, not crumbles!